Crew Love [Intern Edition]: Antonio Wooten Jr. I really relate to Mortar’s mission and vision. I respect Mortar’s ability to be very transparent and explicit about their efforts to target minorities and underrepresented peoples who often get left out of the equation when it comes to upward mobility and access to information about capital, land, labor, and entrepreneurship. Throughout my life and especially between 2015 and 2016 I’ve been blessed to encounter some actively engaged people and in the process gained more knowledge about the problems within my city and what I can do as an active member in my community to be the change I want to see. Having known about MORTAR for some time now, it only made sense when the stars aligned and God ultimately helped to join our forces and put me in a place that directly connects with my vision and purpose. I want to do graphic design for the forgotten and marginalized people. If you could only listen to one artist’s music for the rest of your life, who would it be? Why? Vince Staples. His rawness and ability to explicitly talk about the powers that be, the systems of control, and the chaos in his world and that which surrounds him is unmatched. He’s very unfiltered and it’s heard very clearly in not only music, but interviews too; he’s a comedian lowkey too. I like to design, whether it be logos, tee shirts, flyers, or whatever is brought to me to challenge me. I feel like the world can/will always need and benefit from more great design and less mediocre design. I enjoy eating, which I can do quite well (always up to trying a new eatery), writing (poetry for the majority), and spending time with close friends and family genuine, especially deep in conversation about whatever’s going on internally and/or externally. “Major (key).” A community without entrepreneurs, an active economy, and circulating dollars can’t thrive or be self-sustaining. I don’t think there’s a science to solving most of the problems in the world and more specifically our communities. I believe that entrepreneurship is an integral part to solving problems that exist, especially because the larger stake that people have in their community (by owning businesses where they live) and its well being, the less likely their communities are to fail, experience crime, or fall to shambles. 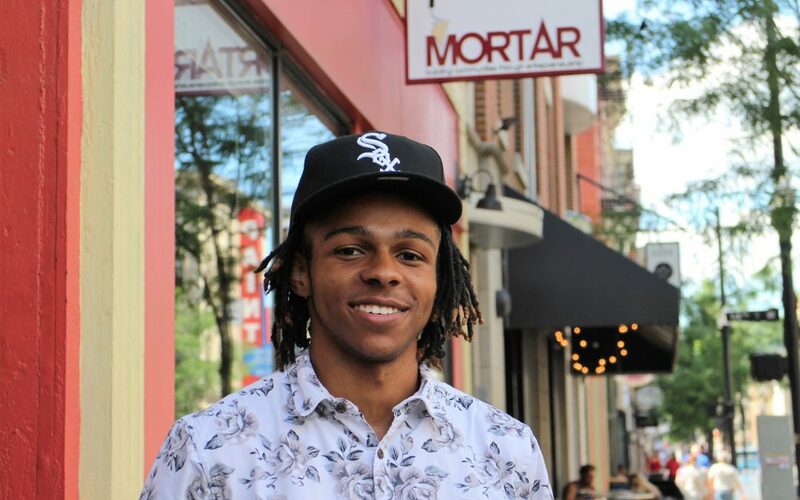 I believe that Mortar’s is the glue between people’s ideas and the actualization within their communities which helps to address the large inequity between neighborhoods in Cincinnati; which neighborhood you come from here can almost control your access to upward mobility, but ultimately more entrepreneurship and general ownership in one’s community can help to change, if not fix that.